The year 1996 - the anniversary celebrities continued. In January the first fanclub-gig at the Brixton Academy, London. At this gig the band performs the songs of the new album "Don't Stop" to members of the official Status Quo fanclub. The "Don't Stop" album is a covers album including the bands favourite songs of other artists and bands, which they liked to play at rehearsals, sound-checks etc. The "Don't Stop" album became a massive hit in UK. It went to No.2 of the UK charts. In May and June another very successful german tour. But its also the year when Francis Rossi released a solo-single and a solo-album "King of the doghouse". At the end of the year the then "Don't Stop"-Tour was changed into "Can't stop"-Tour because of the non-stop touring of the band. And Status Quo is represented in the "world wide web", the official website was published in December 1996: www.statusquo.co.uk. And another german fanzine was published in Germany called "Don't stop". The annual UK-Tour rounded off another successful and remarkable year. Pictures: Cover of the Franics Rossi single "Give myself to love" - cover of the japanese Best of CD "Roll over lay down", Cover of Francis Rossis solo-album "King of the doghouse" - Cover of the french Best of-compilation "The very best of Status Quo" and the german compilation "Caroline Best". 28.01.1996: the first ever fanclub gig of the offical "From the makers of..." fanclub was held at Brixton Academy,London. Status Quo introduced the songs of the new cover-album "Don't Stop" to around 3,000 fanclub members. The songs were played play-back and the show was filmed and later released on video. The Beach Boys were on stage to perform their song "Fun, Fun, Fun" together with Status Quo. Brian May appeared on stage when the song "Raining in my heart" was played. After a break the band returned to stage and played a full Status Quo show live. Again Brian May appeared on stage to perform a stunning version of the Shadows classic hit "F.B.I" with Rick Parfitt and Francis Rossi. January 1996: the "Rockers Rollin"-Newsletter No.10 was published. 04.02.1996: there is a Status Quo special "30 years" in the german radio station SWF3 out of their series Diamant". The german Status Quo expert Gunter Roder was interviewed. 11.02.1996: Status Quo at the german football Bundesliga. Before the match of Hamburger SV against Bavaria Munich Status Quo played the song "Fun Fun Fun". A notable gig, because drummer Jeff Rich stayed with his drum master school at the Falkland island and his substitute was John Lingwood (Manfred Mann's Earthband). 12.02.1996: UK-charts entry of the album "Don't Stop". It became a massive hit - ín the first week 100,000 copies were sold and the album went to No.2 only beaten by OASIS. 19.02.1996: release of the single "Fun, Fun, Fun ". (Cat.No. : Polygram TV 576263) Originally recorded and released by the Beach Boys in the year 1964. The single was released as Picture Disc, as Maxi-CD und in UK as cassette. B-side was the song "Mortified", which was written by all band members. Additional song on the Maxi-CD is the 'extended fade' of "Fun Fun Fun". The vocal parts of the Beach Boys were recorded in USA. Most remarkable in the music history: more than 30 years after the original recording they needed another lyrics for the song. The original version had only 2 minutes running time and 30 years later it was decided that the songwriters had to write additional lyrics. Notable is the intro played by Rick Parfitt and Andy Bown. 26.02.1996: UK-charts entry of the new single "Fun, Fun, Fun". Highest position was No.24. 29.02.1996: in a press conference Status Quo declared that they sued BBC1 because of not playing their hits. February 1996: the "Rockers Rollin"-Newsletter No.11 was published. February 1996: the official fanclub published his new magazine "From the makers of..." Vol.2 No.3. Content: an exclusive interview with all band members about all songs of the "Don't Stop" album. 13.03.1996: kick-off of a scandinavian tour in Kopenhagen with a total of 15 concerts. 18.03.1996: release of the "Don't Stop" single. (Cat.No. : Polygram TV 576635) Originally recorded by Fleetwood Mac in 1977 and issued on their legendary album "Rumours". B-side was the song "Temporary Friend" which was again written by all band members. Additional song on the Maxi-CD is an 'extended fade' of "Don't Stop". The single was released as Picture Disc, as Maxi-CD and as cassette (UK only). 23.03.1996: Status Quo in german television; in the ARD-Show "Geld oder Liebe" (money or love) they played the song "Fun Fun Fun". Francis sings all lyrics; before this performance the new lyrics were sung by the Beach Boys. But the Beach Boys haven't been at this show. 25.03.1996: the "Don't Stop" single entered the UK singles charts and reached No.35. March 1996: the "Rockers Rollin"-Newsletter No.12 was published. March 1996: the german hardrock band "Halloween" covered Quo's "Rain". This version was issued on their single "Power". April 1996: the "Rockers Rollin"-Newsletter No.13 was published. 01.05.1996: start of the german tour in Cottbus. Status Quo played a total of 16 shows in Germany. Special guests are Little Egypt, with the Francis Rossi sons Nick (guit. ; voc.) and Kieran (bass). 16.05.1996: the Status Quo show at the Phillipshalle in Dusseldorf was braodcasted live via the german radiostation SWF3 in their series "Lifetime". May 1996: UK-release of the video "A rockin anniversary" by Game Entertainment. (Cat.No. : Game Entertainment G1013) Its a re-release of the original "Anniversary Waltz" video (1991). 23.06.1996: Status Quo played at the Moscow Dinamo-Stadion in front of a 75,000 crowd. Deep Purple played at this festival too. The festival was recorded for a later TV broadcasting. 25.06.1996: promo show in front of 1,000 people at the "La Cigale" in Paris. June 1996: the "Rockers Rollin"-Newsletter No.14 was published. 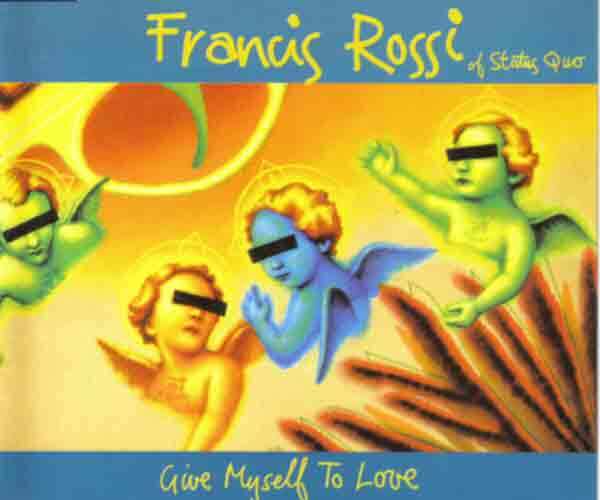 22.07.1996: UK release of Francis Rossis solo-single "Give myself to love". (Cat.No. : Virgin Records VS 1594) B-side was the Rossi/Frost composition "Someone show me home", which was issued on Quo's "If you can't stand the heat" album. The single was released as Pictue Disc, as Maxi-CD (with the additional song "King of the Doghouse") and as cassette. 29.07.1996: "Give myself to love" entered the UK-charts notching up on No.42. In Poland the single climbed up to No.1 (!). July 1996: the 2 german shows in Dortmund and in Gelnhausen at the Hessentag had to be cancelled by short hand. July 1996: the "Rockers Rollin"-Newsletter No.15 was published. August 1996: Status Quo played at a festival in La Coruna, Spain. August 1996: the official fanclub published the new fanzine "From the makers of..." Vol.2 No.4. Contents: Interview with the band about the "Don't Stop" album and an interview with Franics Rossi about his solo-album. 16.09.1996: release of francis Rossis solo-album "King of the doghouse" (Cat.No. : CDV2809). The album included 10 songs, 7 songs were written by Tony McAnaney, who was the producer of this album. The songs "Isaac Ryan", "The Fighter" and "Someone show me home" are written by songwriting partners Francis Rossi and Bernie Frost. 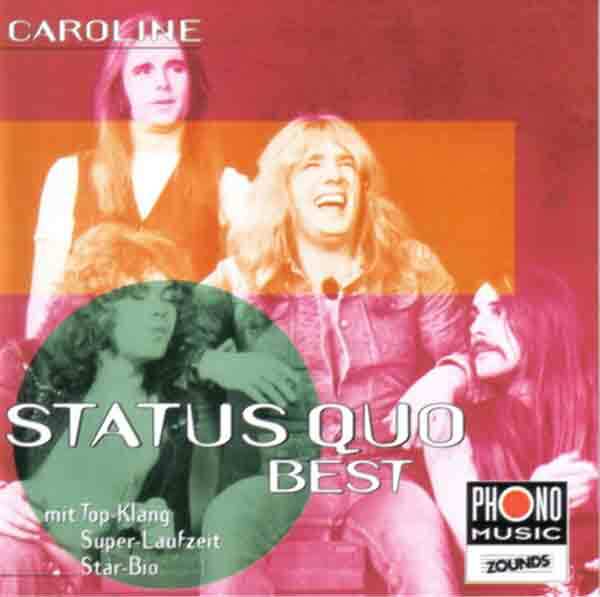 September 1996: the german ZOUNDS Label Phono Music Stuttgart released a digitally remastered Status Quo Best of-CD called "Caroline - Best" (Cat.No. : CD27200682B). 21 songs are included on this CD. Cover see picture above. September 1996: the dutch label Disky Records released the Status Quo compilation "The Hitmachine" (Cat.No. (Cat.No. DC 869802). The CD included 14 songs from the PYE period 1966 - 1971. September 1996: the "Rockers Rollin"-Newsletter No.16 was published. 28.10.1996: UK-release of the single "All around my hat" (Cat.No. : Polygram TV 576 975). The song was originally recorded in 1975 by Steeleye Span. The b-side was the song "I'll never get over you", which was recorded by Johnny Kidd & The Pirates in 1963. Additional song on the Maxi-CD is "Get out of Denver", Bob Seger and his Silver Bullet Band wrote this song in 1974. The single was released as Picture Disc, Maxi-CD and as cassette (UK only) . October 1996: the "Rockers Rollin"-Newsletter No.17 was published. October 1996: Jana Engelhardt from Sangerhausen/Germany published her Status Quo fanzine "Don't Stop" the first time. Its in DIN A5 format and included 18 pages. It contented a gig review of the `96 Magdeburg concert, a japanese discography and an interview with Francis Rossi which was held before the Magdeburg show. October 1996: Rick Parfitt and Francis Rossi are presented with the "Gotcha! ", a trophy, which is given to artists who are taken for a ride in Noel Edmonds show "House Party". 04.11.1996: UK charts-entry of the new single "All around my hat". No.47 is the highest position. November 1996: the first Status Quo phone card is published in UK. It shows the "Don't Stop"-album cover. It was a limited edition of only 1,000 phone cards. 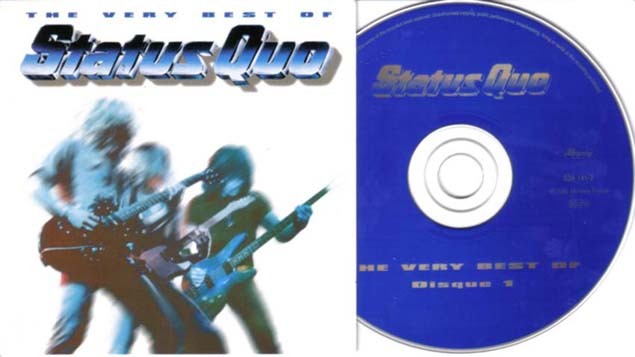 November 1996: Mercury Records France released the 2x-CD "The very best of Status Quo". (Cat.No. : 534 140-2) 23 songs are on this compilation, who was released in France. See cover above. November 1996: the "Rockers Rollin"-Newsletter No.18 was published. November 1996: the 'A Nice Day'-label released the 2x-CD "Jackie Lynton Band - Alive! at the Bleak House". On this live-album 2 Status Quo songs were played by Jackie Lynton and his band: "Don't waste my time" and "Rockin all over the world" (Cat.No. : AND CD12). 03.12.1996: the annual UK-Tour kicked-off in Swindon. The tour was christianed "Can't stop" tour and Status Quo played a total of 16 shows. Special guests are Steeleye Span. 13.12.1996: the show in Brighton was recorded by radio BBC2 and it was later (8.2.97) broadcasted. 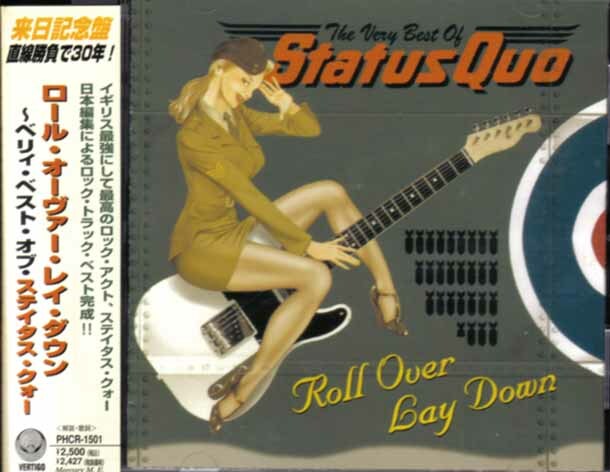 At this show Status Quo played the Beatles-Song "Get back" which is included on the "Don't Stop" album..
December 1996: Mercury Music Japan released the sampler "Status Quo - Roll over lay down" (Cat.No. : Mercury Music PHCR1501) 15 songs are issued on this CD. Notable: the 2 Live-Songs "Little Lady" and "Most of the time" are taken from the Status Quo concert in Tokyo, Sunplaza Hall from 17.11.1976. Cover see above. December 1996: a 3-CD-Box "Rocking all over the world" was exclusively released by german's Weltbild-Verlag. The box included the 3 Spectrum-CD's "Pictures of Matchstickmen"; "Its only Rock n Roll" and "A Few bars more". December 1996: another german Spectrum-label release: this time the CD "Rockin' On" (Cat.No. : Spectrum 554 154-2). 18 songs from 1975 - 1992 are issued on this sampler. December 1996: the "Rockers Rollin"-Newsletter No.19 was published.